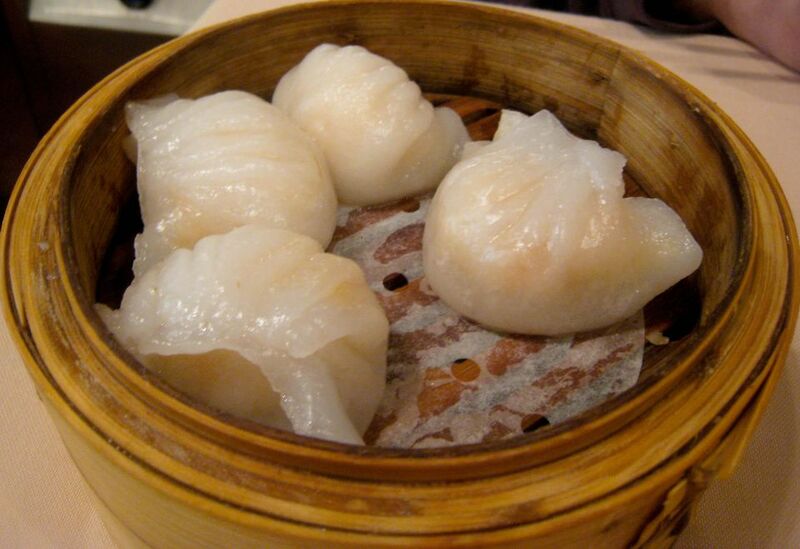 Whether listed on the menu or featured on the dim sum cart at your local Chinese restaurant, har gow (xia jiao), or steamed shrimp dumplings, are often the most popular items ordered. Translucent wrappers hold a shrimp and vegetable mixture seasoned with rice wine and sesame oil, making for a delicate and light-tasting dim sum. Luckily, it's not too difficult to make your own at home. The most challenging part of har gow is handling the dough, which is very sticky and can break apart easily—a good tip is coating your work area and equipment with vegetable oil. Note: While there are multiple steps to this recipe, this shrimp dumpling is broken down into workable categories to help you better plan for preparation and cooking. In a medium bowl, combine the wheat starch, tapioca starch, and the salt. Slowly stir in 1/2 cup of the boiling water. Add the oil and begin using your hands to shape into a dough. Add the remaining 2 tablespoons of boiling water if the dough is too dry. Don’t overwork the dough, but continue shaping for about 2 minutes, until it is smooth and shiny. Place the shrimp in a medium bowl and add the bamboo shoots, green onion, rice wine, sesame oil, salt, pepper, egg white, and cornstarch. Mix well. Cover and refrigerate for 1 hour to give the flavors a chance to meld. Coat a paper towel with vegetable oil and use it to oil your cutting board or work surface and the broad side of a cutting knife or cleaver (a cleaver works best). Keep the dough covered to prevent it drying out while preparing the dumplings. Break off 1 teaspoon of the dough and roll into a ball. Flatten the ball of dough by pressing it in the palm of your hand. Lay the dough on the oiled work surface and press down on it with the oiled side of the knife or cleaver to form a circle that is 2 1/2 to 3 inches wide. Place a heaping teaspoon of filling in the middle of the wrapper, spreading it out evenly, but not touching the edges. Carefully lift the top edge of the wrapper and fold it over the filling toward you (you should have a half circle now). Use your thumb and forefinger to form pleats in the dough, and pinch the edges closed. Place the completed dumplings on a plate and cover with a damp cloth to keep them from drying out while preparing the remainder of the dumplings. Prepare a steamer and an oiled plate that will fit inside the steamer. Place a few har gow on the oiled plate and steam the dumplings in batches, until the wrapper is translucent and the shrimp appear slightly orange, around 13 to 15 minutes. Serve the har gow with hot chili oil or soy sauce for dipping.